Food makes up some of the most vivid memories of my life so far….watching my mother make it, tasting it and endless discussions at the dinner table….when I began cooking post marriage ….. I would most naturally alter the way I made something based on how it tasted….a little bit of this, a dash of that, till it became at least a poor imitation of what my mother and peddi had cooked up….then I turned vegetarian, and I had to summon a lot more thought into making weekend cooking more interesting and wholesome (cos I always thought meat was more interesting at the table)….some of the stuff my mother used to make that I had insulted and rejected, suddenly began to provide succor to my table…. one such is the “mukkala pulusu or karam pulusu”…..it always had loads of vegetables in it and I wanted to believe they were rejected by all the other dishes that we being cooked and derived strength in collectively being simmered in a pot…..imagine to my stunned surprise that K took to it (it is an Andhra preparation I think) like a fish to water and now it is made on at least two weekends a month ……it goes well with plain dal (meetha dal, mudda pappu) and is a good substitute to sambar. The left overs can always be mopped up with dosa on Monday morning (since batter is made on Sunday!!) and making a vegetable side dish is optional since it already contains a medley of vegetables (whatever’s in your fridge really). It is also very accommodating with as many or as few vegetables that you have on hand and treats them all equally…. You can always dress up the meal by serving it along steamed rice, papad, ghee and pickle…and suddenly you have a table full of food!! 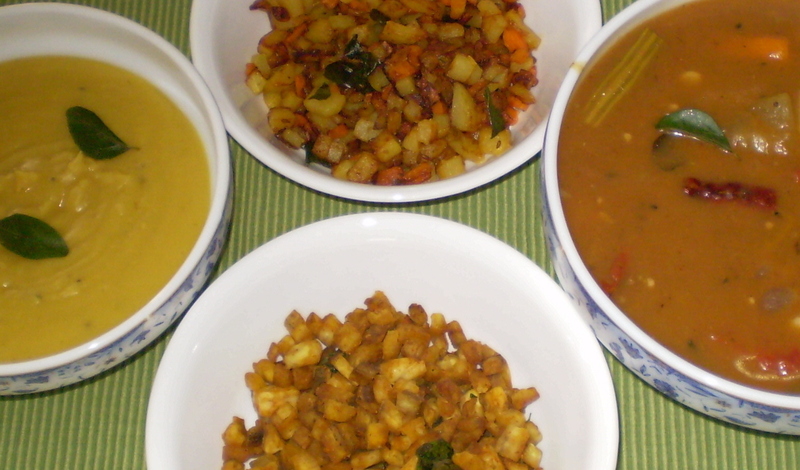 that’s exactly what we had for our Sunday lunch today….mukkala pulusu, mudda pappu/ meetha dal, aratikaya (raw banana) vepudu, potato and carrot vepudu and curds ……….now for that afternoon nap!! Heat oil in a pan, splutter the kalonji,(it adds a nice flavour, alternately the mustard, jeera combine is good too) add the dry red chillies and curry leaves and stir for a few seconds. Add the chopped washed vegetables and stir fry till well coated in the oil. Fry for a few minutes till the onions become pink, add the turmeric, chilli powder, sambar powder and stir fry another minute or so till the masalas lose their rawness. Add the tomatoes and 1½ glasses of water, salt to taste and simmer till the vegetables are cooked. Ensure they aren’t overcooked or underdone. Now add the tamarind juice and simmer till well blended. Check for seasoning and alter if required. Add about a cup or so of water and bring to the boil. Dissolve the besan in a few tsps of water and add it to the pulusu stirring continuously to make sure it doesn’t lump, continue to cook for a minute or so stirring frequently. Turn off the flame and let it stand for at least 15 minutes before serving with steamed rice and papad. 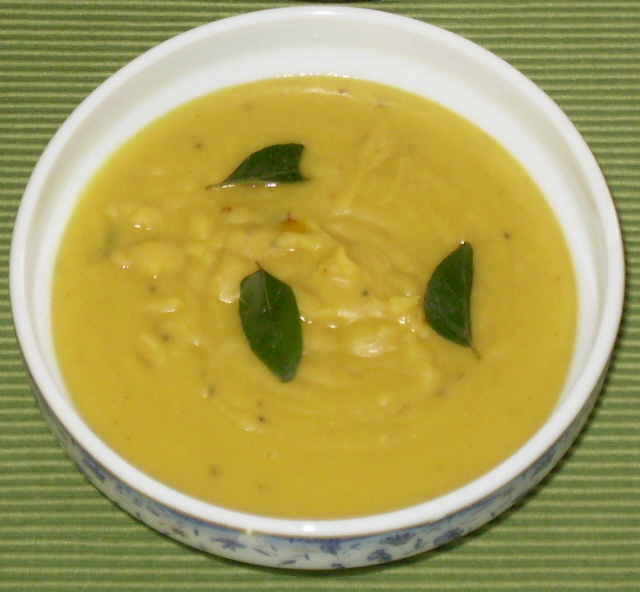 Wash and pressure cook the dal with asafetida and turmeric till soft. In a bowl put the chopped vegetables, turmeric, salt and chilli and mix well with a spoon. Let it stand for about 15 minutes. 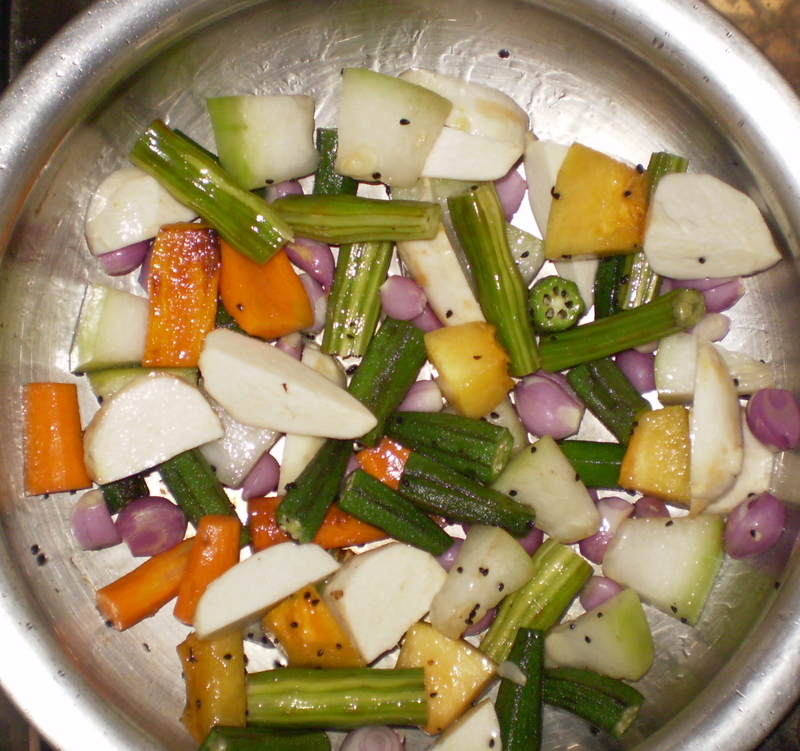 Heat the oil, splutter the curry leaves, add the marinated vegetables and cook on slow heat till golden and crisp (about 10 minutes). Serve. Also for majjiga pulusu the method is different no? 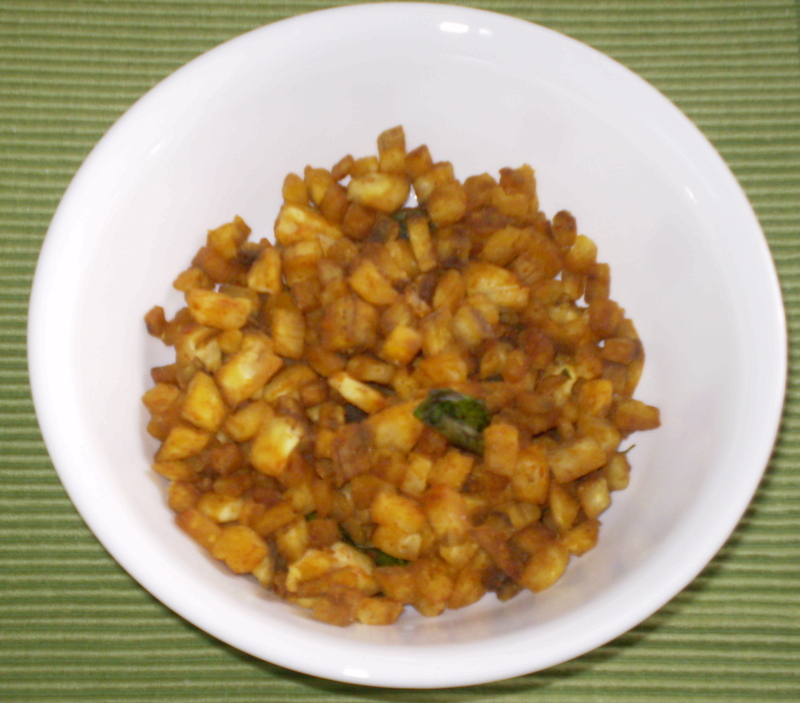 The quanity of besan is much more and the buttermilk is cooked with the flour so both have to cook. 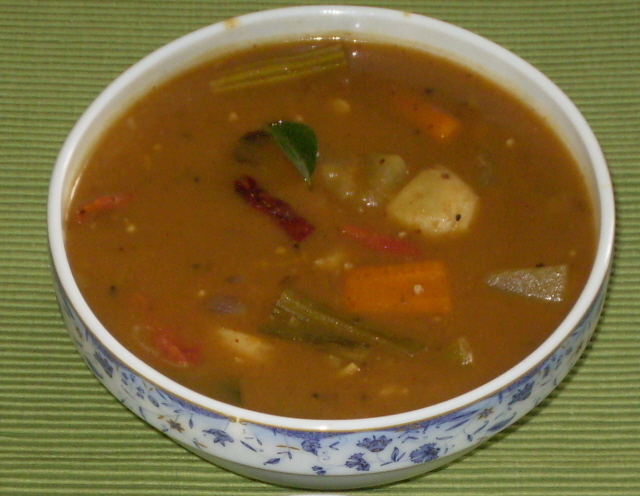 In the case of mukkala pulusu, the gravy is already cooked and the besan is used only to thicken it. Everything looks super! You deserved your nap! the banana-potato-carrot combination is an interesting one that I plan to try.